What is the CompTIA Security+ online course? The CompTIA Security+ is one of the most in-demand qualifications in IT security. This vendor-neutral certification gives you the relevant knowledge and skills needed to install and configure systems to secure applications, networks and devices and other functions needed to be a trusted and reliable IT security professional. CompTIA's globally recognised Security+ certification with training and live labs that will teach you everything you need to know to protect IT networks and systems from cyber threats. The official CompTIA Security+ exam. The cybersecurity industry has seen rapid growth in the last few years and this trend is set to continue. The evolution of technology has brought greater security concerns to the fore as cybercriminals continue to produce more sophisticated attacking techniques. The rise of cyber warfare means that as things stand, there will be a global shortage of cybersecurity professionals of 2 million in 2019. As attacks continue to grow in sophistication and frequency, businesses are going to need more people like you to protect their IT systems. Being in information systems security is a role that holds a lot of responsibility, but with the right training and knowledge, it reaps huge rewards. The Mile2 CISSO course will teach you in-depth theory of how you can implement core security concepts, practices, monitoring and compliance across the information security management spectrum. Business of all sizes rely on technology, but what happens when this technology fails? A natural disaster, human error, or programming fault can lead to massive disruption for services and products, costing companies in revenue and resources. Is the Official CompTIA Security+ online course right for me? The CompTIA Security+ course will validate the credentials of any IT security professional. If you are an IT professional looking to build a foundation in IT security, then the CompTIA Security+ is the perfect place to start as you utilise an understanding of vendor-neutral technologies and practices. 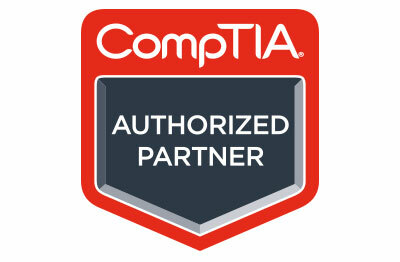 CompTIA	CompTIA is the world’s leading tech association. Their membership community of experienced IT professionals collaborates to develop their certifications, providing invaluable feedback to keep the courses and qualifications relevant. What job could I get with an Official CompTIA Security+ online qualification? The same as you would get if you did it in a class! There is no difference, the qualification is still the same and just as valid, allowing you to function in job roles such as IT Support Technician, Senior IT Support, Cyber Security, Information Security, Network Security and Cyber Security Analyst. We want to make sure you get all the support you need - that’s why we offer you access to our unrivalled support network that includes our WeCare Programme and Live Chat Tutor Support in your CompTIA course, so we’re with you every step of the way; all the way from IT zero to hero! This course is made of many different learning styles including video content, practice assessments and Practice Labs, which all go the distance in teaching you everything you will need to know to pass the CompTIA Security+ exam. The course content is broken down into bite-size, manageable chunks that you can work through at your own pace with 24/7 course access. This is supported by progress reporting which will help you to dictate your time and study at a consistent rate. All our courses come with a free CV review for guidance and tips on how you can make the most out of your first impression with every employer. We have a payment plan to suit you. Whether you want to split your payment over a few months or a couple of years, we can cater to your financial situation. e-Careers are a CompTIA Authorised Training Partner, ensuring your training materials, labs and exams are recognised and official. All course content is up-to-date meaning that you can only learn using the latest and best course materials, with the content being closed mapped to the official exams, fully preparing you to pass the exams and implement your knowledge in real-world scenarios. What does the CompTIA Security+ course cover? Pay in 2 to 12 monthly instalments – interest free! Finance is a great way to spread the cost of your purchase. To make it easy, you can apply for and complete the loan application quickly and entirely online. We offer a range of interest free and interest-bearing finance options to help you spread the cost of your purchase over 12, 24, 36 or 48 months. You can either buy online and get started straight away; the best thing about training online is that you can start and study anytime, anywhere! Or get in contact with one of our trusted Training Advisors who will be able to answer any questions you have, they can also get you set up, so you can start your course immediately! Validate your skills in designing and implementing functional corporate networks using the vendor-neutral CompTIA Network+ principles. Hello, I am interested in your "CompTIA Security+ (SY0-501)".